Like many economists, I have been trapped into thinking that there is an equilibrium real rate of interest – a level of the policy rate consistent with stable inflation, a closed output gap, or full employment. The trick for policy makers is to find the magic level. From this perspective, the near-zero bound on monetary policy is only a problem if expected inflation is insufficiently high to set the real policy rate low enough to bring the economy back into equilibrium. Increasingly, it has become clear that this entire framework is deeply flawed. For example, it is very likely that there is simply no level of the real policy rate in the Eurozone that will return the continent to trend growth. Why, after all, should the real interest be this all powerful lever which will single-handedly raise or shrink demand to the level consistent with stable growth and inflation? I have argued elsewhere that real private consumption spending is not a straightforward negative function of real interest rates. Theoretically for any given change in real interest rates there is an income and substitution effect, and there are good reasons to believe that the lower real interest rates go the less stimulus they have, and at very low real interest rates the sign may even change – lower real interest rates cause desired savings to rise. There are two basic reasons. Diminishing marginal utility of current consumption and the income effect dominating the substitution effect. To be clear, this is an empirical question, and there are good reasons to believe that in much if not all of the developed world at the moment lower real interest rates do not boost consumer spending. Importantly, consumer theory doesn’t really deal with the non-trivial issue of which real interest rate consumers use to discount future consumption. This is an even more obvious challenge in thinking about investment functions. Even well-versed theoretical macroeconomists still talk as if investment spending is a straightforward function of the real policy rate. In a recent discussion on why private sector capex was so low, Robert Barro concluded that the expected return on investment must also be extremely low given that lacklustre private investment spending is coinciding with a negative real fed funds rate. He seems either oblivious to the fact that the cost of equity is not low, or deems the equity risk premium less relevant in determining private sector investment spending than the real fed funds rate – which seems decidedly odd. Think of it like this. What is interesting in the post-crisis phase is that the real earnings yield in most developed countries has barely moved, despite a collapse in real cash rates. A firm considering a new, risky, investment would not look to real cash rates to discount returns, but the real cost of equity – which is stuck at pre-crisis levels. Worse still, to the extent that we do not live in a pure modigliani-miller world, firms that can borrow without materially affecting their cost of equity would be wiser issuing debt and buying back shares, rather than engaging in uncertain productive returns. Perhaps unsurprisingly, that’s what many are doing. 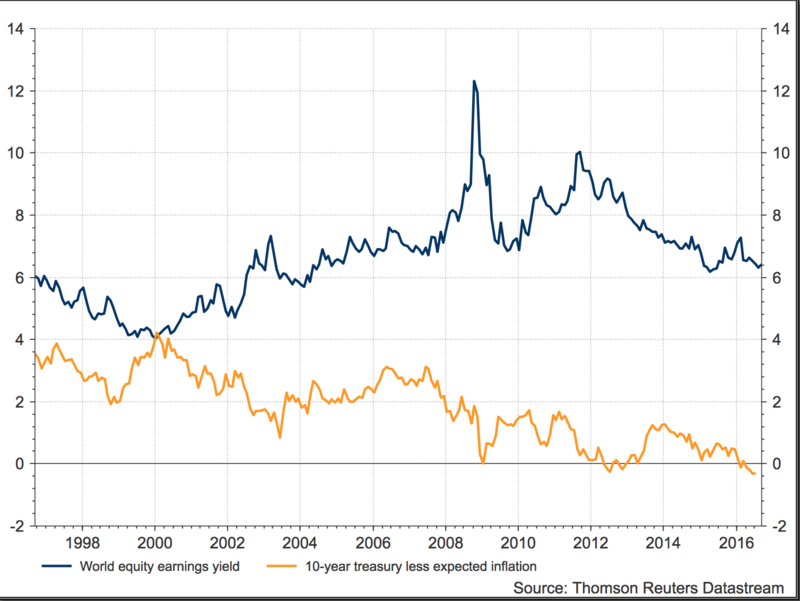 It seems reasonable to argue that if the real cash rate moves independently of the real earnings yield (see chart) that it should have negligible impact on investment spending. Income & substitution effects explained some more, with Euler equations and budget constraints.